Tripura /ˈtrɪpuːrɑː/ is a state in Northeast India. The third-smallest state in the country, it covers 10,491 km2 (4,051 sq mi) and is bordered by Bangladesh to the north, south, and west, and the Indian states of Assam and Mizoram to the east. In 2011 the state had 3,671,032 residents, constituting 0.3% of the country’s population. The area of modern ‘Tripura’ was ruled for several centuries by the Tripuri dynasty. It was the independent princely state of the Tripuri Kingdom under the protectorate of the British Empire which was known as Hill Tippera while the area annexed and ruled directly by British India was known as Tippera District (present Comilla District). The independent Tripuri Kingdom (or Hill Tippera) joined the newly independent India in 1949. Ethnic strife between the indigenous Tripuri people and the migrant Bengali population due to large influx of Bengali Hindu refugees and settlers from Bangladesh led to tension and scattered violence since its integration into the country of India, but the establishment of an autonomous tribal administrative agency and other strategies have led to peace. Tripura lies in a geographically disadvantageous location in India, as only one major highway, the National Highway 8, connects it with the rest of the country. Five mountain ranges—Boromura, Atharamura, Longtharai, Shakhan and Jampui Hills—run north to south, with intervening valleys; Agartala, the capital, is located on a plain to the west. The state has a tropical savanna climate, and receives seasonal heavy rains from the south west monsoon. Forests cover more than half of the area, in which bamboo and cane tracts are common. Tripura has the highest number of primate species found in any Indian state. Due to its geographical isolation, economic progress in the state is hindered. Poverty and unemployment continue to plague Tripura, which has a limited infrastructure. Most residents are involved in agriculture and allied activities, although the service sector is the largest contributor to the state’s gross domestic product. Tripura is the most literate state in India with a literacy of 94.65%. Mainstream Indian cultural elements coexist with traditional practices of the ethnic groups, such as various dances to celebrate religious occasions, weddings and festivities; the use of locally crafted musical instruments and clothes; and the worship of regional deities. The sculptures at the archaeological sites Unakoti, Pilak and Devtamura provide historical evidence of artistic fusion between organised and tribal religions. 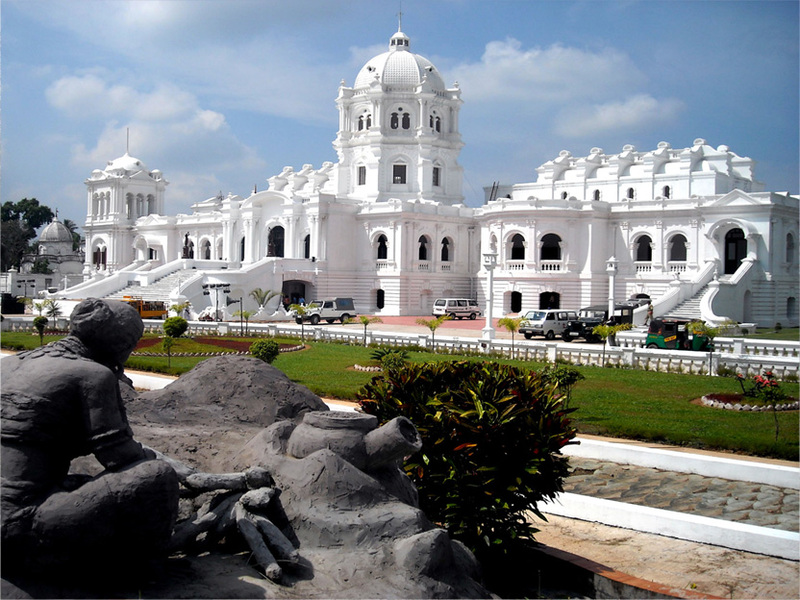 The Great Chinmoy in Agartala was the former royal abode of the Tripuri king.